No, it was just a Thanksgiving visit with her son. You can't have a "send off" tea without a nosh! When Sally called, my larder was bare! Not a cookie or crumb to be had. But, she'll be back and our adventures can begin again! The cake is a quick cake -- one bowl, one pan. in those early marriage days of my mother and father. and several of my mother's recipes are really her recipes! This cake is one of them. And because it made at 8 inch square it was made often. Often, too, it was left unfrosted. It was a great treat to come home to from school. Sift sugar, flour cocoa, salt and baking soda into a bowl. 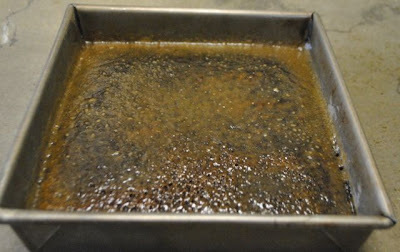 Make a well in the center, and add melted butter and the liquid ingredients. Pour into an 8 inch square pan. (which has been greased and floured). Bake for 30 minutes. Cool completely before spreading topping. Turn oven off. For topping, mix brown sugar, butter and heavy cream. Spread over the cooled cake and set under the broiler for 1 minute. Watch carefully to prevent burning. Allow frosting to cool. Serve from pan. 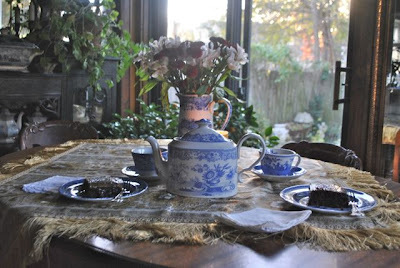 It's Tuesday and I'm joining Marty at A Stroll Thru Life for Tabletop Tuesday and Sandi at Rose Chintz Cottage for Tea Time Tuesday and Bernideen for Friends Sharing Tea. What a special treat to send your friend off with! 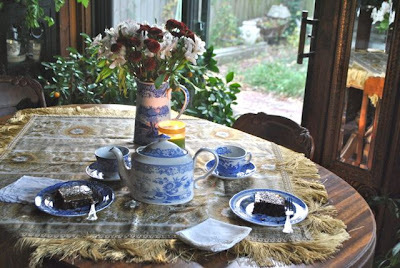 I love the beautiful in the simplicity of something as conversation with a dear friend over some delicious chocolate and tea. Girl time is wonderful! I have a friend, Cheryl, and we did everything together when I lived North of you!!! I missed her terribly every year when she was gone for a week's vacation, so I know how you're feeling now! While my friend was away, I'd conger up some new adventure for the two of us a short while after her return...usually Pittsburg shopping for the day, sometimes Louisburg!!! Keep busy and start planning, she'll be back soon!!! Meanwhile, thanks for sharing another GREAT recipe!!! Oh, Pat -- we do have plans -- a BIG trip -- NORTH probably! Hi Marha, what a nice tea you set for your dear friend and you being so thoughtful to bake a cake. It sounds delish, especially with the wonderful topping. Martha, that was a lovely tea you set out for your good friend and yourself. I always enjoy seeing your beautiful Spode and my teacup today is also a Spode. When I found it, I immediately thought of you and I love it! Your cake sounds delish! Those old recipes are the best, aren't they! Thank you for coming to tea today and I wish you and your family a Happy Thanksgiving. I'm sure you had a wonderful time! I always love your Spode. I have that cake recipe from my mother. We had it often when I was growing up. Because of the simplicity, I think it was one of the first thing I made by myself...I think it was a bit burnt, if I remember, but...LOL! Happy Thanksgiving! its always hard to separate friends, although it is only for a time. How nice to have such a tea and treat togehter with your friend, before she left. One never knows what will happen. I wish for you she came back soon. Mrs. Bolands chocolate cake lloks really yummy. Thank you for sharing this recipe. So nice to have friends for tea and how thoughtful to send her off on her adventure with a chocolate tea! I do like your blue and white Spode. Thank you for the recipe. Happy Tea Day and Happy Thanksgiving! Oh how I love an impromptu tea party with chocolate cake too. Just perfection! I love how you are always prepared or can whip something up at the last minute for company Martha. I'm going to try this cake myself. I hope you are enjoying a nice Thanksgiving with family; we celebrated on October 7 so I have time today to do some catch up visiting with tea friends. 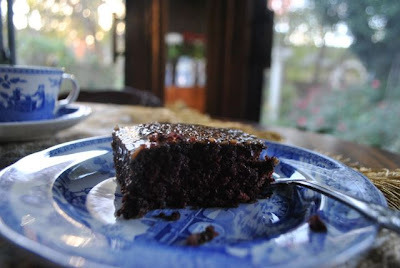 Mmm, Chocolate Vinegar Cake is the name we had for it when I was growing up. Each of my sisters and I entered it in our local fair (different years) and it always got a first place ribbon. You sound like a wonderful hostess and friend. I enjoyed visiting your blog.